Notaries have been around for a long time. Babylonian notaries chiseled the oldest written law into stone over 4000 years ago. At that time, notaries were wise and trusted members of society. Their role was to oversee transactions and guarantee their fairness. BC Notaries have professional standards dictated by the Notaries Act of BC. They also are governed by the rules, by-laws and best practices of; and are members of The Society of Notaries Public of British Columbia. 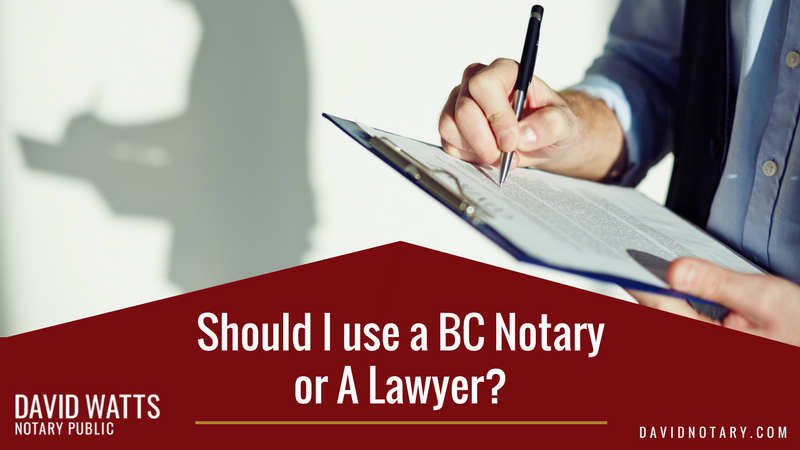 How Is A BC Notary Different From A Lawyer? 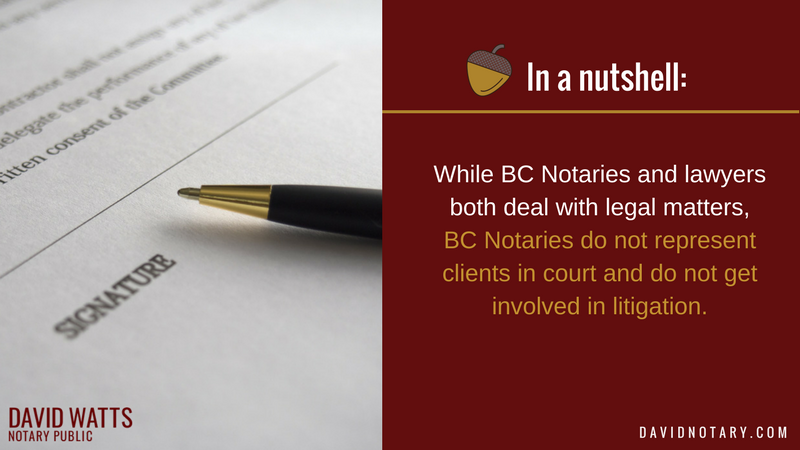 While BC Notaries and lawyers both deal with legal matters, BC Notaries do not represent clients in court and do not get involved in litigation. In British Columbia, their work is restricted to non-contentious matters in which all parties involved have already reached an agreement, like in real estate transfers, mortgages and estate planning. Witness that the party to the document has signed the document in our presence. Confirm the place and date where they have signed as well as ensuring they understand it and are not signing as a result of any undue influence or coercion. Confirm their identity to make sure the person actually signing the document is the person referred to in it. Another difference between lawyers and notaries has to do with their training. Lawyers need both an undergraduate degree and a law degree. They also must pass a provincial examination and article at a law firm for a year before they practice. BC Notaries now complete both an undergraduate degree and a Master of Arts in Applied Legal Studies; as well as writing statutory exams administered by provincially appointed examiners. They also must be accepted into The Society of Notaries Public of British Columbia. BC Notaries have mandatory continuing education in the areas where we practice. BC Notaries are very well trained in the areas we practice. Many people think it’s better to use a lawyer in a transaction because if things don’t go according to plan; they might need a lawyer to represent them in court. However, that is not the case. A lawyer who’s main practice area is conveyance would likely not take a case to court themself. If we act for you in a residential real estate transaction; our experience will help us to identify issues and deal with them before they become problems. 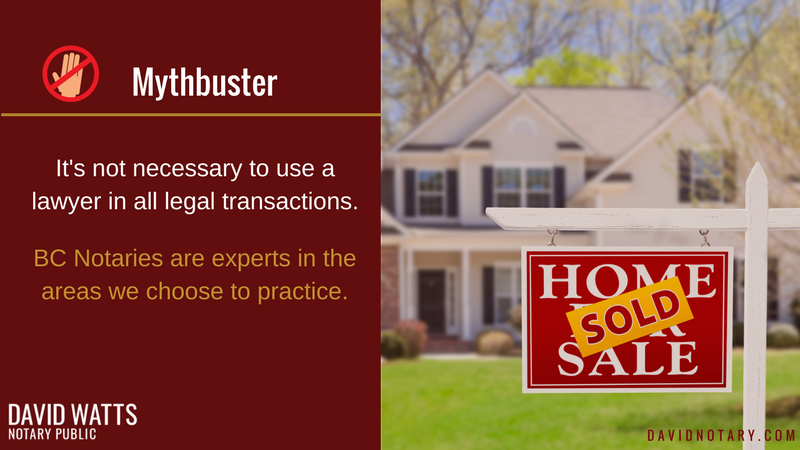 Conveyancing and litigation are both very different specialties. We feel it’s better to work with a specialist than to find someone who is more of a generalist but doesn’t really specialize in anything. We are those specialists. How Do I Know Which One to Go To? 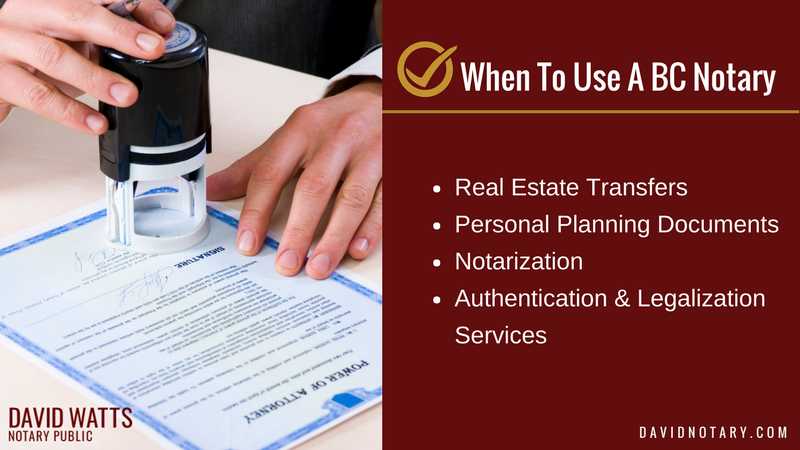 Choosing between a notary public and a lawyer depends on what kind of legal services you want. Get Certified True Copies of Documents for use in Canada and around the world. In British Columbia, all lawyers are also “notaries public” which means they can legally act in the same practice areas as BC Notaries. Some lawyers choose to practice in the traditional areas of BC Notaries. All BC Notaries receive ongoing training in matters of real estate, wills and estate planning; as well as notarizations for use in Canada and around the world. Whether you choose to work with a BC Notary or a lawyer; it is always important to choose someone who has expertise and experience in the area where you require service. Listen to advice of colleagues and ask for a referral. Find someone you are comfortable with and feel that you can get to know, like and trust them. Finally, get in touch. Together we can determine whether a BC Notary can help, or point you to a trusted lawyer.